One of the country’s leading schools, Trinity College, Kandy today signed an agreement with the Education Ministry to admit the 6 year old child from Kuliyapitiya, who was deprived of a school following rumours that he was HIV+. *Principal Andrew Fowler-Watt signed the Memorandum of Understanding with the Minister of Education Akila Viraj Kariyawsam. A Memorandum of Understanding was signed between the Principal of Trinity and the Ministry of Education. Accordingly, Trinity College will fund the child’s entire education until he completes his studies at the school. “Today Trinity College welcomes young Rahal from Kuliyapitiya as he now becomes a part of the Trinity family.” Trinity College said in the school’s official Facebook page. Meanwhile, the Education Ministry has also taken the necessary steps to provide the child and his mother with accommodation in Kandy. Even though Zahira College, Kurunegala came forward to provide the child with admission, the mother had turned it down on grounds that the child will not stay without her. The agreement comes after President Maithripala Sirisena directed the Education Ministry to solve the issue urgently. Website “Lanka e news” will be very disappointed now as it started a mud slinging campaign against this mother and child spreading a story told by the Grama Sevaka of that area. Unlike the petty minded Sinhalese Buddhists like BBS Gnanasaras , Trinity College has come to the rescue of this poor child. Hats off for Trinity College. Believe or not today things seem to quickly moving than had been before. It is all because each and everyone is being criticised by the listerners and observers – freedom is given to them for their right- which is to add their own cirtiics. Here the gratitude goes to MY3 and RW to have set a press freedom of the style to judge the things today. Recalling the days, Rathupaswala people were protesting for the cheapest food stuff – drinking water – were attacked by state hired army men – things stood so stagnated. That went days. But see, the issue with the HIV mother and child – it has already resolved. This is where when things are open to all. As a Thomian, I am happy to have found a good School, for you to commence your studies and demonstrate to the world that you are worthy child. A fantastic and heartening gesture. Well done Trinity These are things that make me proud about Sri Lanka. Particularly when we demonstrate that we are civilised. This move kills the BBS, MR’s SinhaLe movement, the so called “proud to be Sri Lanka” types in one big swipe. Where are the socalled nationalists Wimal and Gamanpilla. Perhaps they see it more important to attack Ranawaka than to help a Mother in dire need. Helping another countryman when society imposes its social wrath on you is when we should stand-up and say ” I am proud to help another Sri Lankan. Where is the BBS ? It can’t even issue a statement In favour of its Sinhala Buddhist daughter and son? This is how false and fake they are . Finally it has to be a Muslim School and a Christian School that comes to the rescue by rightly overlooking race and religion. Well done Trinity for demonstrating such compassion , love and true patriotism. Gnanasara and Gammanpila won’t be silent very long. Very soon they will make a statement saying this incident is a clear example of how Christians convert poor Sinhalese Buddhists by giving lollies. Their stupidity has no limits. Non-Buddhist school comes to the rescue of a poor Buddhist child whose fundamental rights have been violated by the so-called Sinhalese Buddhist villagers and the education authorities of Kuliyapitiya. This is an eye opener for these people. They must be envious about the outcome. The principal of Trinity College can do another great service to the education of Sri Lanka by admitting Akila Viraj Kariyawasam, our education minister, to the same class as this child so that he too can start schooling. I hoped Royal should have done this. Yep. Must say in this regard Trinity won hands down. Melted our hearts in the process. They beat both Reid Avenue boys in Colombo 7 and School by the sea in Mount Lavinea. Ananda stands with egg on its face. Trinity has set an example for all to follow. 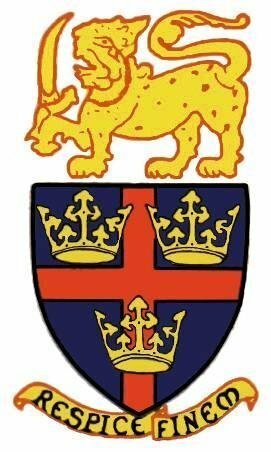 Royal should award this year’s Bradby Shield to Trinity as a mark of our nation’s admiration and gratitude. PS: Please expect the jealous BBS, Sinha Le types to start screaming soon with their endless Christian conspiracy theories. Enjoy the coming show. Hats off to you bloody Trinitians, old & present, dead & living. I envy your courage and compassion. I am from a sister school and am very proud of Trinity, Bishop Dhilo and the Principal. They have done the Christian thing. Great news, and a photograph to back up the authenticity. It looks as though this MoU has been signed in the Minister’s office. I recognise, from left to right, Bishop of Colombo, Dhiloraj Canagasabey, Andrew Fowler-Watts (the recently appointed Principal of Trinity College), and AVK (the Minister of Education). The other two I don’t know. Secondly, money has indeed to be spent on this. It is important that during the next few days the country (which has been obsessed with this problem for a month now) should know where the money is coming from. I should imagine that “the school” is footing the bill. That means that the parents of the current students, from whose fees all expenses are met, are paying; and each and every parent can be proud of sponsoring this child. Thanks to the Bishop and the Principal for arranging all this. I have said that because it is very easy for some persons to do charity with other people’s money. On the other hand (while the government helps this school in various ways, many of the teachers are entitled to government-paid pensions after they retire, and free text books are received), it would be a terrible precedent if just because some nasty parents in Kuliyapitiya made a fuss, and because the the minister of education said some pretty dumb things the Education Ministry foots the bill. Your argument would be right only if the Education Ministry’s grant to Trinity would go up as a result of this. That is not the case. The money will come by the school cutting some of its other expenses or from special sources like endowments and donations. I do not know, but either way, the taxpayer will not foot the bill. I salute your generous comment, but I’m afraid that you don’t understand the many types of schools in Sri Lanka. Come the Ides of March 2016, and I may be forced to say things that I don’t want to about these wonderful schools that I owe so much to – and for which I have done much in a low profile way. If I write (and I keep praying that I won’t have to) it’ll be using the name that I was baptised with, and of course, Colombo Telegraph will put my photograph also on; W.T. Keble and R.H. (Bobby) Moses were my Godfathers. I keep praying that I won’t have to write that article. If written, it’ll be thoroughly researched – no “abouts” as below. About 1951, the “Assisted Schools” (they were privately run – as opposed to the “State” – mainly vernacular – schools) were asked whether they wanted the government grants to continue. A number of Anglican schools and just one Catholic school (St Bridget’s) said that they could manage without. A decade later, the picture had changed completely. Apart from all that had happened in Sri Lanka (I’m sure, dear JH, that I don’t have to enumerate them for you), the Vietnam War was on. Then there was the serious attempted coup of 1962. Remember that it was real, and that the Privy Council in England set the accused free ONLY BECAUSE the legislation was retrospective. Ravi Karunanayake’s grandfather was a coup leader, and the beans were spilt by Rosy Senanayake’s father-in-law (ironic, isn’t it?). You can get the details without difficulty, but all this is just to recount how we have this crazy system of education in the country. The schools were “taken over” in 1962. Figuring most prominently in the perception of the public were the Catholic schools, but please remember that the Buddhists lost Ananda, Nalanda, Vishaka and a host of other schools. The Anglicans handed over many schools, both big (e.g. Christian College, Kotte) and small (e.g. the Pannipitiya School – as a result of which Bishop Dhilo got a house bought near the Maharagama Catholic Church and had it converted to the “Church of the Living Saviour”; another would be Uva College, Badulla). The Methodists handed over their best school, Richmond College, Galle, but “held on to Wesley, and Methodist College, Colpetty. “Held on to” is correct; they were not allowed to charge fees, since they hadn’t charged up to then. The Catholics held on to their largest schools with great tenacity – and I’m sure with much suffering; St. Joseph’s (Maradana), St. Peter’s (Bamba), St. Sebastian’s (Moratuwa), Ave Maria (Negombo) – many more, but NOT a huge number of (famous) schools. Today there are in all 72 schools that are “Private”. The large Anglican Schools had no real problem: Trinity, Hillwood, and Mowbray in Kandy were able to legally charge fees. In Colombo: Ladies, Bishops and and S. Thomas’ (which had three “branch schools” – I’ve not capitalised with good reason! All this may HAVE to be explained next week.). Jaffna: S. John’s and Chundikuli Girls’ School. Add to that the following non-Anglican schools – St Bridget’s, and Carey (Baptist), Sujatha and Musaeus (Buddhist), Zahira (Maradana – Muslim). In 1978, J.R. Jayawardena, (good to think that there is something that we can thank him for!) changed all that. He paid the salaries of all teachers in “Catholic Schools” (actually, you should add Wesley and Methodist to that list); they are popularly called “semi-government”. The Anglicans did not really need any assistance, and didn’t take it, but a certain number of teachers (it depended on the staff-student ratio determined to be desirable by the Education Department) became “eligible” to receive government pensions for life. He also allowed the Board of Investment (or something like that! – my knowledge is a bit wonky on this – and the government wanted it like that!) to start “International Schools” NOT recognised by the Department of Education as educational establishments. They paid taxes – that was all that seemed to matter! Incidentally, Mr Fowler-Watt is a former Principal of Colombo International School (Gregory’s Road), and the (Maldivian owned!) British School near the Kanatte – which charges around Rs 60,000/= per month. No new “Government Recognised” private schools can be started today, but being “fully-private”, they do start branches, and expanding in various ways. Apparently you have to pay to see it now; I downloaded 16 pages for free many years ago. Clergy, including Bishops, come in all shapes and sizes. Trinity suffered much because of this guy who purloined government money for five years by forwarding pension claims for his dead mother-in-law! Dhiloraj Canagasabey, and his predecessor, Duleep de Chickera, are of quite different calibre; and on ALL National Issues they’ve been right – but “education administration” – that is where I have my reservations. In this case Dhilo (I know him well and his family well) has acted fast and decisively. But can he stand up to establishment pressure in certain other matters? Lastly, though, “young Rahal from Kuliyapitiya” is the little guy who matters, and I wish that they’d change his name – or do something like that. Obviously, right now, all the children will know all the history, but with a changed name he may be able to live an adult life (while we are kicking up the daisies) without people making snide remarks. “Gossip” travels fast nowadays, but fortunately, people also forget fast. And how will he transition from poverty to a “snob school”? I’m not trying to be censorious or nit-picking; sociological realities have to be faced! I think it is time to reveal all…you are obviously very knowledgeable about matters that should be in the public domain now due purely to the amount of clout the alumni of these institutions have wielded for a century and continue to do. You “think it is time to reveal all…” . . .
You are right about why this is of “national importance”. It’s not because we, personally, are great. We all have a role to play. Just a correction: I’ve visited the “Private Schools Branch of the Ministry of Education” (Director, Mr M.P. Salahudeen) and discovered that the number for Private Schools has grown to 80. A few that were moribund have been revived. Where is the Anglican Church heading in matters other than this? Their action relating little Rahul was laudatory, but an easy public relations exercise for the Church, and for Trinity. Let us hope that they labour diligently at more difficult, mundane tasks. Well Done Trinity – “the best school of all” I know the students at Trinity will accept this boy without question, let us hope they will be able to neutralize the mental trauma already caused to this child. It is time this example of acceptance no matter who or where you are from, can be followed as a nation, only then can real progress me made. Trinity was the first to jump in to offer this place, you lead, others just follow! I dont know much about Trinity, I thought it was for beach boys – anyways – I never met anyone from Trinity got the admission to Peradeniya University towards the end of late 80ties. the difference between stupidity and genius kis that genius has its limits. Yes,(English) Professor Walter S. Perera , you too are a distinguished academic produced by Trinity; and if we are thinking of the Engineering Faulty in the 1980s, there were, from Trinity, Dr Nalin Wikramanayaka (PhD later from MIT), Lareef Zubair, and a guy who was called “Sarpaya”, by everybody including Prof. Ashley Halpe. And the Medical Faculty had Niranjan Tillekeratne and Vernidharan, and Dinesh (Thilapiya) Fenando; these are names that come to mind, just to counter Ms Maralathoni. In any case none of them went round the University shouting out that they were from “the Best School of All”. Once in the University they identified with the other students there, form Galaha M.M.V., Velvettithurai Central or whatever. Why can’t people be just what they are, and act as human beings caring for one another. And those were difficult days, with racists correctly identified by the Lanerolle Committee, but never punished. Please do not make condemnatory comments in the same incomplete form as I give you some half remembered facts. Well done Trinity! This is true exhibition of wisdom and compassion for a fellow human being in trouble. I am not a Trinitian, I am a Richmondite. I salute your courage, wisdom, and compassion. Continue to teach these great qualities to pupils who pass through you. I agree with you, absolutely. The media must receive a lot of gratitude. It is good to know that a Mahindian appreciates this. As for me, my second persona, after “Sinhala_Man” ,is “game iskole mahattaya”. Both reflect truth. But also, I was educated throughout at S. Thomas’, and also at the University of Peradeniya. Sometimes the truth is more complex than at first appears. It may be that in six days I have to reveal another side to all this. I hope I don’t have to! Hats off to trinity and her OBA , well done guys , a real heart warming story amid many nasty stories about the poor child. Thanks to trinity ,Akila Viraj is extremely lucky to escape from the fiasco ,Hadn’t Trinity come forward to help the poor child , AKV would have been exposed . Trinitians, we as a nation salute you guys . AKV is exposed. Look at the picture again: standing naked. Don’t you notice the adapana joystick? Long time no see, brother – where had you been ? Yes, Trinity has learnt all other buddhist schools a lession. Why was Ananda, Nalanda and other BUDDHIST schools stayed as if they are fed with clay ? Is that the nature of sinhala buddhists ? Above all the man who goes on kissing everyone s child – former President Mr Abusive of all times stayed silent regarding the issue ? why – is it not his area where he got votes to save his bum ? Hi , how are things with you , hope every thing is ok ! Well , i’ve been busy with my stuff ;hence, did not have time to do the typing . still, whenever i get a chance i always do the honours by chipping in . When all the schools kept a deafening silence about that poor child’s admission , only Trinity came forward and volunteered herself to rescue the vulnerable child , it’s a real shame of our so called ” Elite sinhala Buddist schools”, basically none of those schools wanted to get involved ; thus , they just behaved as if nothing happened . i’m particularly concerned about Kurunegala so called leading Buddist schools , where was that compassion , wisdom ? i think it’s a wake up call for our so called sinhala Buddist school , hope they have a learnt a lesson . Christian Charity at one of its best moments, in this modern age of our beloved Mother Lanka. This historic gesture should make not only Christians, but all of us Lankans proud. Few things are clear reading all these comments. We seem to still define ourselves as Christian and Buddhist. Christians sing praise coz one of their schools have come to help this child but heap scorn on Buddhist schools. The Buddhists on the other hand say bad things about Christian schools. How petty minded. Can you not say that one school’s wrong has been righted by another? Instead of doing a back and forth between Buddhists and Christians? Grow up! Many things are clear from reading these comments. Your country is 80 per cent buddhist, but where is your compassion. The Venerable Buddha had compassion, practised compassion, and lived with compassion. How come, that venerable compassion has not reached your countrymen specially your buddhist clergy. Compassion comes from religion no matter what it may be, so how come a buddhist institution never came forward to help that little boy and his mother. Christians are not singing praise but showing what christian compassion is at the darkest hour of a little boy and his mother. Nobody is heaping scorn on buddhist schools but showing the world where buddhist schools were, when they should have been in the forefront. The buddhists are not saying bad things about christian schools, it is shaggers like you who want to disturb a hornets nest. Yes ! many can say that many school’s wrong was righted by one. Since your country got independence in 1948 there has been much going back and forth between all religions and that is why people like you are struggling for inner peace and communal harmony. It is common knowledge since 1948 that your greedy politicians used the buddhist topic to get power and rob your country lock, stock & barrel and it is clearly exposed now with regard to a little innocent boy and his saddened mother. You need to GROW UP and GROW UP right now to know the difference between Christianity and Buddhism. The first is a religion and the latter is a philosophy. Both founded by good, hunble, compassionate, loving, forgiving, men. You shagger instead of going back & forth between reality and stupidity stick to one, and stop shagging. GROW UP. THANK YOU TRINITY COLLEGE SRI LANKA. May you be blessed by all faiths. I think that what “Samba wan” has said is that education ought to be secular, but with a firm commitment to place the child at the centre. It is mandatory in Sri Lanka for every child to study – and pass! – one of the four major religions in the country. I feel that such a practice discourages freedom of thought, but I don’t want to start such controversy in relation to schools. The Anglican schools have a healthy mix of students from all four religious backgrounds, which is healthier than “mono-religious” composition. But let it not be imagined that this is by choice. There are fewer than 35,000 Anglicans in the entire country. The clergy themselves acknowledge that it is very difficult to get accurate figures since so many come to church in the morning as “the family”, but owe their real allegiance elsewhere. Little real thinking goes in to religion nowadays. Religion has to be left to individuals; the schools ought to show that some perennial issues have to be faced. Even the “free-thinker” has to arrive at his agnosticism after following a conscious line of reasoning. If this does not happen, what sort of future citizens will we leave behind on this planet? First off, Hats Off to Trinity for giving a new life for this poor kid and the mother. This kindness of them make us feel great, and proved to be Sri Lankans. Where were all those so called late champions and defenders’ of Buddhism, and the joint opposition when this episode was being played out. Both of them never uttered a word, and lifted a finger to help this poor kid and the mother. We owe a great gratitude to the main stream and social media for highlighting this issue until a solution was found. This includes our great media champion CT as well. This is Sri Lanka, when there is a human problem, all rally round together irrespective of their differences. All in all, My3 and Ranil are real champions for keeping their men on their toes to get a good outcome for this issue. It’s real and true Yahapalanaya. Yes, this act shows that Sri Lanka is in for a great time. God bless Sri Lanka. Great job Trinity. ” The best school of all” – lives to its name! The outpouring of anger against an irresponsible, ignorant and silly Minister of Education in the free media in this case achieved a good result. All errant Ministers and other politicians must take notice. Unlike during the time of the MARA Mafia they will be held accountable by the free press. Now back to Yahapalanaya maestro My3. What will you do with this ignoramus that you appointed as Minister of Education in Sri Lanka. Show some guts and move him on. You are so great in creating Ministries where non existed before. Please create a Ministry for Moda Meeharakas and put this man Kariyawasam in charge. How could any Government school like Royal or any ‘Buddhist’ school help this child? All ‘Buddhist’ schools are controlled by the ministry of Education. They are not private like Trinity. You have made a very significant statement. In my pretty long comment on March 10, 2016, at 3:27, I have made the point myself, but it’s got lost in all the other rigmarole that I’ve put in! Few know the Anglican schools, specifically S. Thomas’, as well as I do, but we have to understand that we must have real respect for Buddhism; obviously we have total contempt for the BBS and for the likes of Gnanasara. The story of that school is probably typical of how “average State Schools” evolved, although I think that the school in Pita Kotte remains “above average”. The key man here was Dr E.W. Adikaram, whose “disciple” Prof Palihawadana is. Adikaram had stopped cadetting (since its an adjunct of war mongering); you will notice that it was only after the take-over of schools that cadetting returned to the schools; I, for one am personally appalled at how important cadetting has become in ALL State Recognised Schools, but not in the “International Schools”. I wish Trinity College had not revealed little Rahul’s name; to change it now would also be wrong for many reasons. He must keep his identity; also the Anglican Church ought to arrange for the mother to regain her dignity by being provided meaningful employment, but NOT, obviously, in the school. Also, she must be made aware that EVEN IF all the Anglican generosity makes her feel like “converting” she must not do so until the son leaves school. Thanks, Paul. I may have said too much; I’m confident that the point made by you will get home. I needs must research and write more!